Went to Marukai 99 Superstore in Waipahu today in search of some cheap bento accessories only to find out those bastards closed the store! GRR! Very sad.. I ended up going to Don Quijote again and bought a bunch of bento things I needed such as more nori, vinegar, sushi seasoning, sauces, etc. 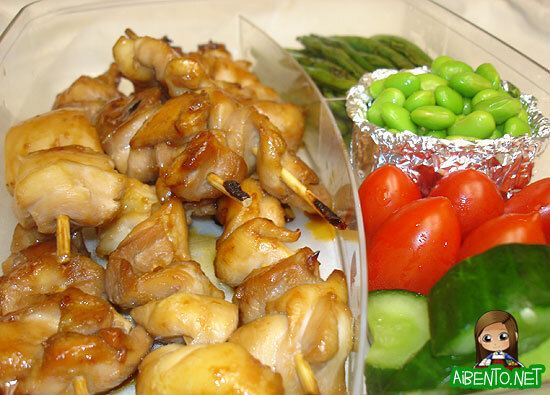 Since we were planning on going to the UH Football Ohana Festival at Aloha Stadium, I packed a yakitori chickenYakitori means 'grilled fowl' in Japanese, but is a commonly used term to refer to grilled, skewered food in general. bento for all of us and hid it deep in the bottom of the diaper bag in order to sneak it past the guards. We didn’t think we would make it in, but the lady barely looked into the bag. I didn’t get to marinate the chicken for very long, so most of the taste was on the outside. We ate it cold, because we were waiting in line for Colt Brennan for almost 2 hours. We were one of the last people to get an autograph and picture, getting to him in the final minute of his autograph session! The beans did not hold up well at all, they were all shriveled and uneatable by the time we sat down to watch the practice. I made some extra chicken for tomorrow because we’re going to the zoo and I’m going to fry some yakisoba tomorrow and the chicken will go nicely with it. I didn’t have any appropriate container, so I just used one of my Tupperwares. 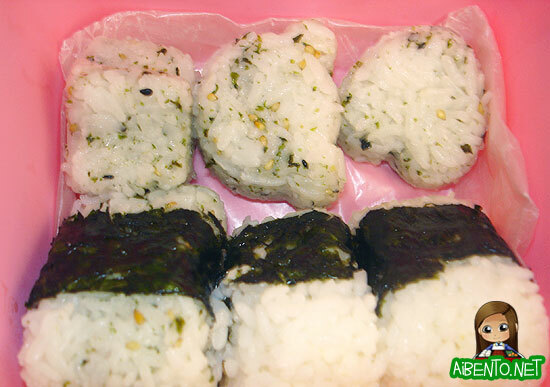 The onigiri I made didn’t look so good presentation wise because I didn’t have a good container. I forgot to salt them, so hubby made a face when he ate his. Oops!